It was lovely to spend three mornings at Briercliffe Primary, Burnley, during late April. Visit one kicked off with a KS2 author assembly where I explained the writing and illustrating process. 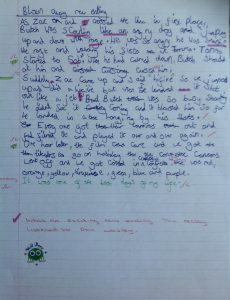 The children listened so well as the multiple drafts of Danger Zone were displayed and I revealed how Martin draws Eric. The session finished with a performance of one of the Tales. A great start to the week! After hot-footing it to Year 3, I recapped a story from the first set of Tales. The story features a boy with uncontrollable wind! The children pulled apart the ending from the story and then planned their own version. They generated some ace ideas and I’ve included four examples of their edited writes below. 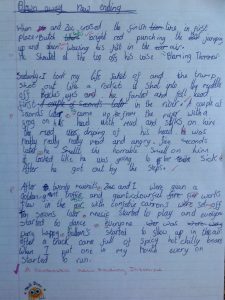 Visit one concluded with another writing workshop where I repeated the Blown Away session with the fantastic pupils in Year 3/4. A top first visit! Visit two began with a KS1 storytelling assembly. The children from Foundation, Year 1 and Year 2 heard a couple of Tales during a 35-minute story session. We battled with a fierce pirate and tried to recover a ring from a cow pat. It was a joy to perform the Tales with such a fab bunch of children. Next up was a writing workshop with Year 4. 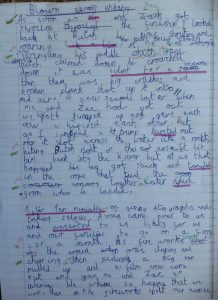 I repeated the Blown Away session and the children literally blew me away with their ideas and writing energy. To finish the morning, I worked with Year 5. We discussed nasty characters from books they had read before I unleashed a character I’m currently working on. 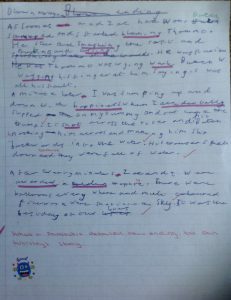 Bazza is a fearsome character and the children pulled apart my writing before they created their own Bazza. A brilliant ending to a fab morning! The final visit featured writing workshops with Year 5/6 and Year 6. We explored nasty characters and the children created their version of my Bazza. The energy and writing buzz in both classes was a joy to behold. A book signing finished off the week. After lots of questions and suggestions for future stories, I headed home reflecting on what had been a great week at Briercliffe. Thanks must go to Mrs Robinson for organising the visits and helping to promote the book signing. I had an ace time working with every class in the school at Briercliffe. Hopefully I’ll see all the children and staff again in the future.